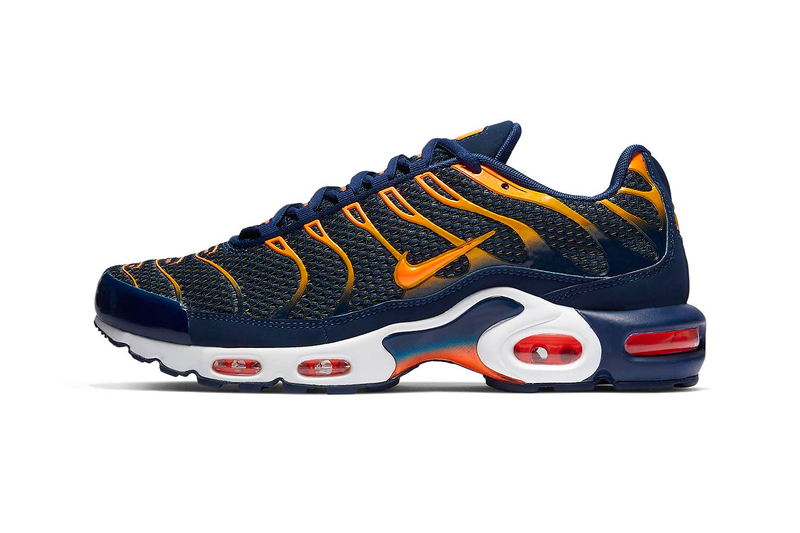 Following Nike‘s plethora of Air Max Plus TN releases to celebrate its 20th anniversary, the cult classic returns in a menacing “Blue Void/Total Orange” colorway. Earlier this year, Drake showcased a sneak preview by wearing a modified version of the shoe on-stage during his ‘Scorpion’ tour. Adorning a two-tone color structure similar to the classic “Sunset” and “Hyper Blue” iterations, the “Blue Void/Total Orange” colorway relishes in a bold blue base alongside a white outsole. Contrasting accents arrive via the “University Gold” and orange detailing on both the cage and the Air Max cushioning unit, maintaining the classic yellow TN branding at the posterior. You can now purchase the Nike Air Max Plus “Blue Void/Total Orange” for $160 USD directly via Nike UK’s web store and will likely be able to purchase the colorway via US-based retailers in the near future. In other Nike news, take a look at the Air Max Plus TN “Greedy” that will be releasing later this week.